A Memorial Service will be held 10:30 A.M., Friday, April 26th at St. Mary’s Catholic Church in Aurora. Rev. Loras Grell will officiate. Inurnment will be at later date in the Atkinson Cemetery. No Visitation. In lieu of flowers, memorials may be made to the family to designate at a later date. Higby-McQuiston Mortuary is in charge of arrangements. Condolences may be e-mailed to the family through the mortuary website at www.higbymortuary.com. 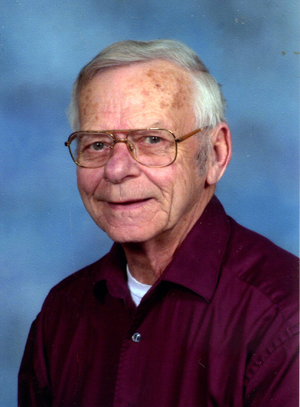 Charles Louis Jansen, the son of Ed and Mary (Steinhouser) Jansen, was born in Atkinson, Nebraska on February 23, 1934 and passed away in Aurora, Nebraska on April 10, 2019, at the age of 85. Chuck’s parents were in the middle of moving from one farm sted to another when Chuck decided to come into this world. He grew up on a farm west of Atkinson, NE. Chuck attended country school through 8th grade and graduated from St. Joseph High School in Atkinson. Chuck married Carolyn Cobb at St. Boniface Catholic Church in Stuart. They lived on a farm for 1 ½ years then moved into Stuart and purchased a grocery store and meat processing business which they operated for 7 years under the name of Jansen’s Market. To this union were born three children: Wayne, Jody and Casey. While in Stuart, Chuck was a member of St. Boniface Catholic Church, Knights of Columbus and a volunteer fireman. Chuck worked at Grand Central Super Value in York, NE as a meat cutter before purchasing the Herbst Drive-In at Aurora in January 1964. After a year, the Drive-In name was changed to Chuck’s Drive-In. He also owned and operated a half section of farm ground south of Aurora for 12 years. He enjoyed working with cattle. Chuck was a member of St. Mary’s Catholic Church, and Honorary Lifetime member of Knights of Columbus. He served on the Chamber of Commerce board 4 years, Aurora Country Club board two years and Aurora Park Board 12 years. He also supported a stock car, bowling teams and Little League baseball. After selling the Drive-In in 1998 Chuck worked at Schneider Hardware and enjoyed raising a picture perfect garden every summer.